The Question is: What type of shader should be uses for which specific case? What are the differences? Should they be mixed? Use diffuse for diffuse reflection, use glossy for glossy/specular reflection, and mix them because real materials also have multiple types of reflection at the same time. It is a common misconception to think that diffuse reflection is caused by the surface irregularities/bumps, but this is wrong, perfectly smooth surfaces still can have diffuse reflection. Actually diffuse reflection is caused by subsurface scattering, but the scattering distance for most materials and rendering scenarios is smaller than the pixel size, therefore luckily we can use the diffuse node instead of the slow subsurface scattering node. For more details, see my answer to a similar question: What is the technical difference between a diffuse shader and a rough glossy shader? Not the answer you're looking for? Browse other questions tagged cycles rendering materials shaders or ask your own question. What is the technical difference between a diffuse shader and a rough glossy shader? 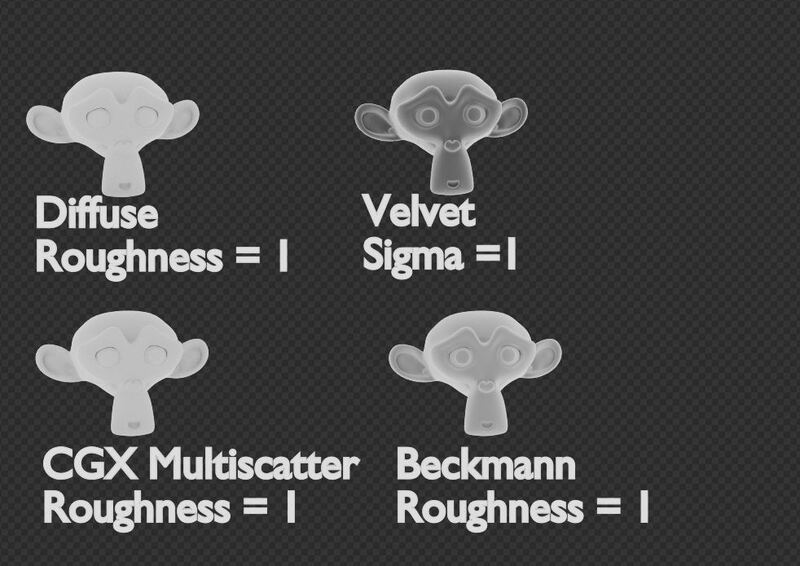 How exactly does the Sigma parameter affect the Velvet shader? Editing group node sockets, with no external input? What can a custom cycles shader do? How can I use vector mapping to control the Anisotropic shader? What are the differences between renderman and cycles? How can I learn renderman? How to add a texture color specificed “glow” to a HUD panel? Cycles - (Shader) Nodes - inputs outputs - What are the exact data types?